Bangalore recently got its first home delivery fuel station that can deliver both petrol and diesel to your doorsteps. This idea can save lot of time as congestion at petrol pumps is a big problem in metro cities. A Bangalore based startup went forward with this idea and introduced the service by getting recognition from Govt of India. 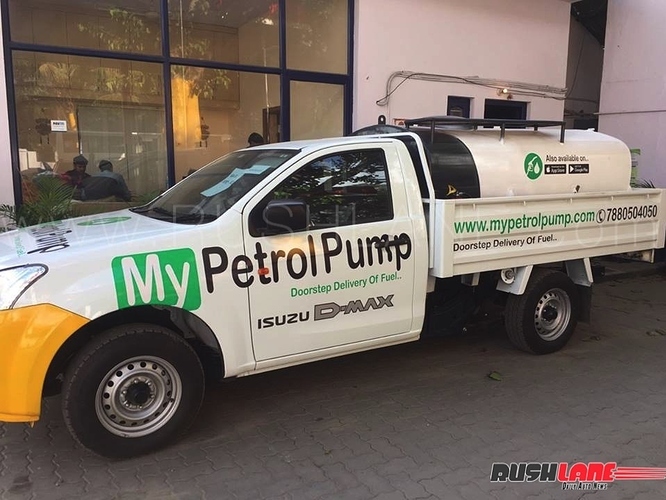 Mypetrolpump is a great venture as one can get fuel right at the door and they currently cover all Bangalore. The service is currently operational from 6 AM to 8 PM while they are planning to expand the same to 24 hours in the coming days. Delivery fee is INR 99 for upto 100 liters of fuel while ordering more than that will reduce the fee to INR 1. Price of fuel will stay the same as normal petrol pumps. This is actually beneficial for those vehicles that have huge fuel tanks. A car with 60-70 liter fuel tank won't get the same benefit as a bus service with nearly 10 fuel tanks worth 200 liter each. The quality and quantity of the fuel is assured by Mypetrolpump.